Corporate Video - Abracadabra Presentation Graphics, Inc.
See video samples of Abracadabra CorporateVideo. Abracadabra can be your off-site corporate video department. We create custom videos, both inspirational and humorous, technical and informational, for internal communications and corporate meetings that we stage. Our capabilities cover every aspect of video production: script writing, studio and on-location videography, editing, special effects and titling, 2D and 3D animations, multi-format media transfer and duplication, DVD mastering – “from script to screen” we can handle it all. Bring us your rough ideas at any stage of development and we’ll create a professional and impactful video that’s on-target and on-budget. Whether your needs are for an inspirational call-to-arms, a dynamic marketing tool or a humorous corporate skit, Abracadabra will help you to relate your message with a video that is focused and effective. 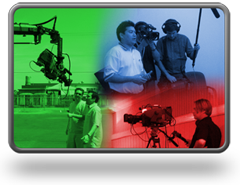 We have a full service video production department in-house, established 25 years ago and equipped with the latest digital video tools. In other words, not only do we have the latest video toys - we also have the experience and knowhow to make the most effective use of those video tools to solve your presentation needs.